Spell It The Right Way! Welcome to my Spelling Lesson Plans page. Is spelling an important skill to have in order to be a successful writer? 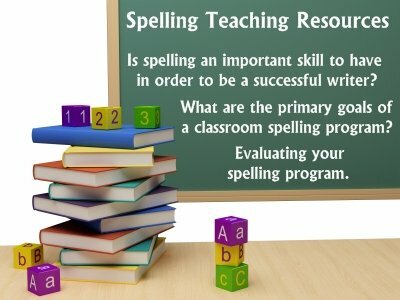 What are the primary goals of a classroom spelling program? Using weekly word lists to build up knowledge of important words. Students' personal lists of frequently misspelled words. on this page assist you in building your own spelling program. Please be reminded that the information on this page is my own personal opinion. 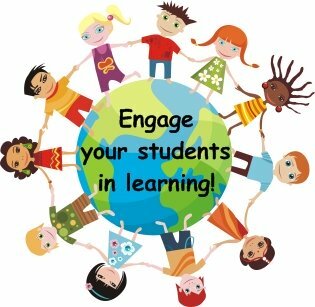 I have used with my own students during my 22 years as a classroom teacher. have in order to be a successful writer? Do you believe that teachers should include spelling lessons as a part of their language arts curriculum? Poor spelling creates a bad impression because it's the first thing a reader notices. Anxiety about spelling inhibits a child's writing, especially their choice of words. 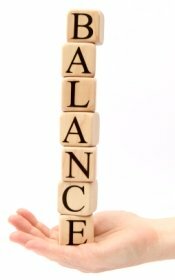 Examiners, teachers, and prospective employers often place undue weight on spelling. Even with the advancement of computers and using a spell checker, students can not rely on spell checkers to correct all of their spelling errors for them (see the poem below for an example). and will continue to be, one quality society expects of a literate person." remain true to the philosophy of whole language." In the years of rapid technology development, many computer users have expressed that they don't need to learn how to spell because the spell checker in their computer will solve their spelling mistakes. of a classroom spelling program? I believe that teaching spelling skills and strategies is part of teaching our students to become proficient writers. It is not the most important skill in the writing process, but I feel that spelling needs to be taught as a part of the language arts curriculum. 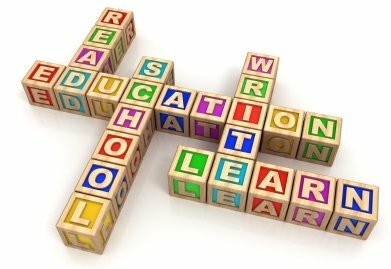 On this page, you will find spelling teaching resources and information to assist you in building your own spelling program. Spelling words used the most frequently in writing should be the words studied by students. Spelling words should be presented in list form, rather than in sentences or paragraphs. Use a pretest when introducing a list of spelling words. Then, each student only needs to study the words that are shown to be difficult for him or her. The test-study-test method is superior to the study-test method when working with most students. Under your direction, allow students to self-correct their own test, as this is an important factor in learning to spell. Spelling words should be words that are already known and used in reading by your students. It should not be necessary to spend time on word meanings. The practice of having a student copy a word several times in quick succession has little or no value in learning how to spell. 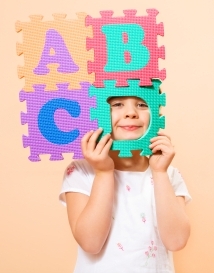 Invented spellings play an important role in a student's spelling development. Once a word has been introduced and practiced, however, the student should be expected to use the standard spelling of that word. 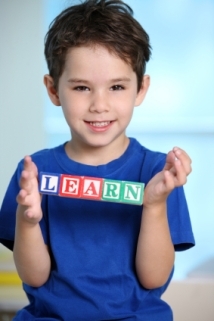 Spelling ability is defined as the ability to write a word rather than to spell it orally. You should not formally assess students on their oral spelling skills. When you are teaching spelling rules to your students, chose rules that apply to a large number of words and that have few exceptions. Spelling words should be presented and written in print form. The visual image of the word in print will match what everyday reading requires, reading words in printed text. 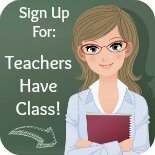 The best time to practice cursive handwriting is during dictation exercises and actual writing activities. 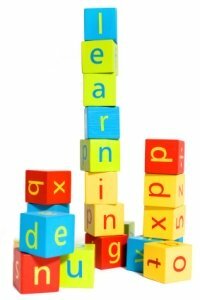 With a teaching degree in learning disabilities and 22 years of teaching experience, I have come across a lot of spelling programs and spelling teaching resources. I have been in schools where my principal has refused to allow teachers to use a spelling program, and she felt that spelling skills would develop naturally in our students. I have seen teachers use spelling programs that spend hours during the school week on teaching spelling through drill and practice. I have found that there is a happy balance between these two extremes. Many of the parents that I have talked with have felt that spelling has been neglected in recent years, and that this neglect shows up time and again in their child's everyday writing. Spelling instruction should take up approximately one hour of instructional time during the school week and should be broken into time slots throughout the week. created in focusing on these five areas of spelling instruction. that you can download and use immediately. After students have mastered reading their high frequency sight words, they should also be able to spell these words correctly in their own writing. Sight words are the most frequent words that students use in their writing, so it is important for children to learn the correct spelling of these key words. Fry 1000 instant words and Dolch sight word lists. The Fry 1000 Instant Words are a list of the most common words used for teaching reading, writing, and spelling. These high frequency words should be recognized instantly by readers. Fry's sight words are a list of the most common words in English ranked in order of frequency. free spelling teaching resources for Fry's sight words. 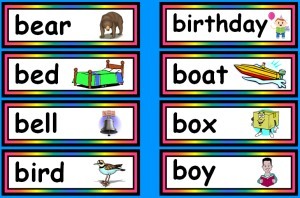 The Dolch Sight Words are a list of spelling teaching resources of the most frequently used words in the English language. These sight words make up 50 to 70 percent of any general text. The Dolch list contains 220 words that have been arranged by levels of advancing difficulty, as well as a list of 95 Dolch nouns. 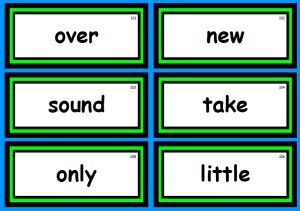 free spelling teaching resources for Dolch's sight word words. There are some spelling generalizations, or rules, that can help your students remember unique spelling features. By teaching your students these common spelling rules, you are helping them to generalize the concept of one spelling rule that will apply to many words. Teachers should focus on teaching spelling rules that apply to a large number of words, and that have very few exceptions to the rule. The following spelling rules apply to a large number of words and have very few exceptions to the rule. I teach these 7 rules to my own students. Below you will find some free spelling teacher resources for words that students commonly misspell. 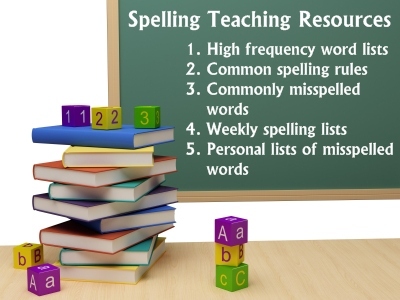 These spelling teacher resources are not leveled by grade, but instead are lists of words that students often misspell throughout all of the primary school grade levels. FREE: The Horrible 100: List and free flashcards of more challenging words that are commonly misspelled. up knowledge of important words. I believe that students should be given a weekly list of spelling words to learn and master. This list should contain between 10 - 25 words, depending upon the grade level that you teach. 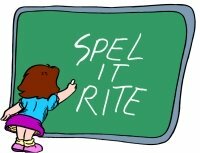 Students who find spelling challenging, should be given shorter lists to master each week. On Monday, students should be given a pretest of the words on this list. They should grade their own paper, marking or highlighting the words that they need to practice during the school week. On Wednesday, you should assess all of the students in your classroom on this word list. Again, students should grade their own papers. Students who miss words on this day, should continue practicing the words that they missed. On Friday, only assess the students who did not show mastery of their spelling words on Wednesday. As you select the spelling words for your weekly lists, you must first consider your students. 7 words from a spelling rule that is currently being reviewed. During the writing process, students should check their own work for spelling errors and keep a personal list of words that they need to learn how to spell correctly. This should be on-going throughout the year and a part of your writing program. Periodically, you should give individual informal and formal spelling assessments to your students based on their own personal lists of words that they commonly misspell. I administer these informal and formal spelling assessments while I am having individual writing conferences with my students. During a writing conference, I have students get out their personal lists of misspelled words. During this time, I help my students decide if they need to add any new words to their lists. Next, I have students practice spelling a few words that are on their personal lists. My students enjoy this individual attention that is directed at their own spelling ability. These informal writing and spelling conferences work equally well with students of lower and higher spelling abilities. 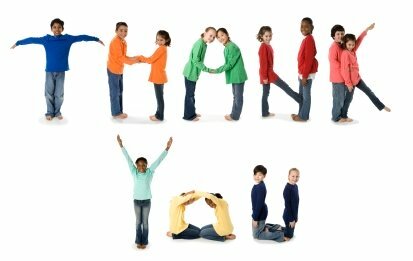 Thank you for visiting my Spelling Teaching Resources page. page assist you in building your own spelling program.